The skin around the eyes is fine and is approximately 0.05mm thick. Do I really need to use an eye cream as I already use serums and a moisturiser? The skin around the eyes is much thinner and delicate compared to the rest of the face. Due to thinner skin, signs of aging around the eyes are seen first. These signs include fine lines, wrinkles, expression lines, crow’s feet and circulatory issues like puffiness and dark circles. The active ingredients in eye creams are specifically selected and formulated in smaller molecular structures to ensure sufficient and better penetration. These ingredients are also specially chosen because of their ability to tackle the concerns relevant to the eye contour. What can I do to help with puffiness around the eye? Never sleep with make up on and avoid the use of mineral oils around the eye area (such as in make-up removers, eye creams and other moisturizers). Mineral oils seep into the eye contour, creates sluggish circulation and slows the detoxification around the eyes. Avoiding processed foods, caffeinated drinks and increasing intake of fresh food and water goes a long way in preventing puffiness. Use products that can stimulate the circulation and detoxification around the eyes. Regular use of eye pads can give the skin an extra boost it needs. Facial treatments with built in eye remedies are highly recommended. Why do I get dark circles and what can I do to fix this? Dark circles are also caused by lack of sleep and sluggish circulation. Too many caffeinated drinks, sugar and bad habits, such as smoking aggravates the condition. In some cases, dark circles are hereditary pigment related and so this can only be improved but not removed. Allergies and medications can also make the eyes appear tired and affect circulation and pigment. By stimulating the circulation, hydrating the skin and removing dull dead skin cells, one can drastically improve the appearance of dark circles to a brighter eye contour. What’s the difference between an eye gel and a cream? Traditional cosmetic eye gels with light textures mostly target circulatory issues like puffiness and dark circles, whereas a cream targets the concerns related to drier skin which lead to fine lines and wrinkles. 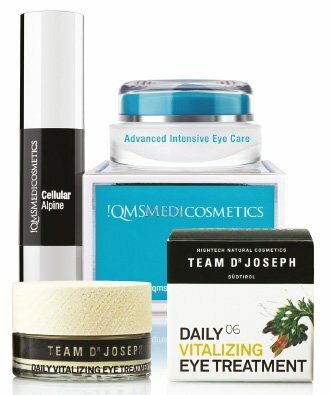 With modern technology and research, QMS & TDJ eye creams are formulated for use around the entire eye contour. The high-tech formulations can now improve and prevent all issues women face around their eyes – whether it be wrinkles, fine lines, puffiness and dark circles. Advanced Intensive Eye care: Targets all signs of aging through its innovative synergistic complex of Persian Silk Tree and Sigesbeckia Orientalis. Cellular Alpine: For the demanding mature eye area, specifically focused on puffiness that appears around the menopausal years. Night Collagen & Freshening Tonic Eye Pads: At-home eye treatment. Facials with built in eye treatments: All QMS treatments include a built-in eye treatment. Daily Vitalizing Eye Treatment: For dryness, sensitivity, fine lines and wrinkles. This eye cream with special Adansonia Lifting Complex is especially great to use all around the eyes and lift droopy top eye lids. Ginseng and rosemary boost sluggish circulation and brighten tired-looking eyes. TDJ Treatments: Includes eye massage to revitalize the eye contour. Is most relaxing for tired eyes. Is there any way that I can reduce the fine lines around my lips? Fine lines, loss of elasticity and deep wrinkles appear around the mouth (perioral area) and is accelerated around the menopausal years. Upper lip wrinkles are short and vertical making them particularly aging and detrimental to the appearance of the face. Specialized targeting products and treatments are needed to improve and intensify results on this area of the face. Lip Line Corrector: Four-fold hyaluronic lip plumping with soy and yam phytosterols which can drastically improve elasticity and wrinkle depth. Immediate effects are seen due to the unique hyaluronic microcapsules delivered deep into the skin to plump from within. Lip Zone Concentrate Treatment: Specifically targets the aging concerns around the mouth. Intensive and immediate results occur from the improved cellular metabolism with the use of oxygen in this treatment. Specialized lip plumping massage techniques combined with high concentration oxygen ensures deep wrinkle plumping for demanding and mature skins. 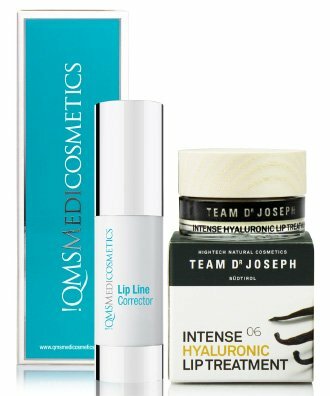 Intense Hyaluronic Lip Treatment: Daily use of this natural lip care gives highly effective treatment for upper lip wrinkles, fine lines and dryness. Adansonia Lifting Complex with hyaluronic acid stimulates natural cellular regeneration to both treat and prevent the aging concerns around the mouth. TDJ Supreme Ultrasonic Facial Lift Treatment: Using specialized ultrasound waves, it improves hyperkeratosis (thickened skin) that develops around the mouth as skin ages and dead skin builds up. Ultrasound treatment stimulates the collagen and elastin. At the same time, it improves the ingredient metabolism deep in the skin leading to long term results. This entry was posted in QMS Medicosmetics. Bookmark the permalink. Stock up this Winter with SKINNY Green Coffee!